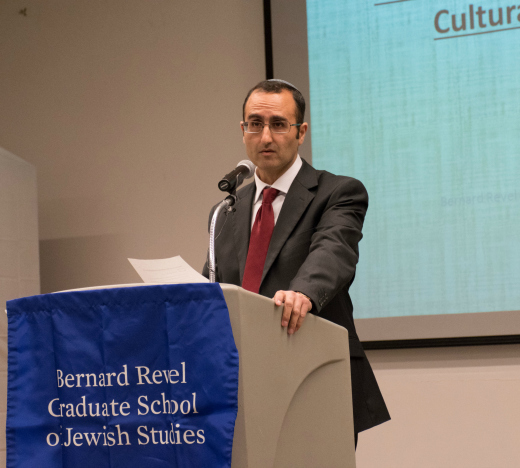 Commemorating the 1948 forced exodus of nearly a million Jews from Arab countries, Yeshiva University’s Bernard Revel Graduate School of Jewish Studies and Sephardic Community Program partnered with the Consul General of Israel in New York to pay tribute to the rich cultural heritage of modern Jewry in Arab lands. Held on December 5, the event featured an address by Dani Dayan, Consul General of Israel, and a lecture by Dr. Daniel Tsadik, associate professor of Sephardic and Iranian studies at YU. They spoke to a packed house in the Koch Auditorium on YU’s Israel Henry Beren Campus. “There have been Jewish refugees throughout history,” noted Dayan in his introduction to the evening, adding that he was himself the son of refugees from Europe and the pogroms of Ukraine who escaped to the safety of Argentina and then Israel. The persecution and expulsion of the Jews in Arab countries and Iran, he said, has been overshadowed by other stories and events, but these Jews and their stories need to be remembered and honored. Tsadik discussed the life and exodus of Jews in Arab lands throughout the ages. Noting the importance of remembering these Jews and the many aspects of their unique cultures, he highlighted their activities in literature, theater, cinema and sports. “There were once impressive, multifaceted, lively and creative individuals and communities that lived in Arab lands,” said Tsadik, whose research focuses on the modern history of Iran, Shi’ah Islam and Iran’s religious minorities. Beginning from the middle of the 19th century, many of the Jewish communities of the Middle East were granted equality and access to education beyond religious subjects, which helped them integrate into their host society. In Egypt, for example, Jews became bankers, merchants and government officials. They published dozens of newspapers in many languages, some of which were intended for Egyptian society at large. Jews were prominent musicians, composers, singers, actors, and athletes that competed on national and international levels, even winning gold medals for Egypt at the Olympics. But when the 1948 war broke out, Jews were suddenly seen as the country’s enemy; the government confiscated Jewish property, and bombs were thrown at Jewish homes and businesses—thousands of Jews were forced to flee for their lives. Tsadik noted that the Egyptian story is not unique. In Iraq, before they were expelled, Jews contributed significantly to Arabic literature and poetry. In Tunisia, Jews were at the forefront of music, the record industry, and theater. Legendary Habiba Msika, a Jewish performer, became a star beloved by both Jews and Muslims.